Ukraine’s poor business climate has been described in numerous studies. The European Business Association’s Investment Attractiveness index (calculated quarterly) has fallen to a five-year low of 1.8 out of 5 after the Ukrainian government did not sign the Association agreement with the European Union in late 2013. The Index of Economic Freedom 2014, published by the Heritage Foundation and the Wall Street Journal, placed Ukraine in the “repressed” category, noting that investment freedom, financial freedom, and property rights are the country’s most challenging areas. But entrepreneurs are hopeful that things might change soon. The newly-formed government has promised to implement long-awaited economic reforms. The short and basic “action program” presented by the recently-appointed Cabinet of Ministers briefly mentions “expanding freedom of entrepreneurship” and “a significant reduction of the administrative functions of economic regulation.” Ukrainian entrepreneurs, and small and medium-sized business owners, should use this window of opportunity to urge the government to take critical steps to help boost the private sector. Regulatory reform is one area of focus. Business owners in Ukraine report that they spend much of their valuable operational time dealing with bureaucracy and unwarranted fines that often lead to demands to pay a bribe. Such problems often arise because of vague and hard-to-follow laws. Requirements for businesses must be thoroughly revised, and a list of grounds for conducting a governmental audit must be limited. Tax reform and corruption should also be addressed. Income taxes that take up more than half of earnings force many businesses into the informal economy, reducing the revenue base for the government. Tax rates and fees should be reformed. Additionally, transparency and fair competition should be respected — businesses should demand clear and unbiased rules to reduce corruption. 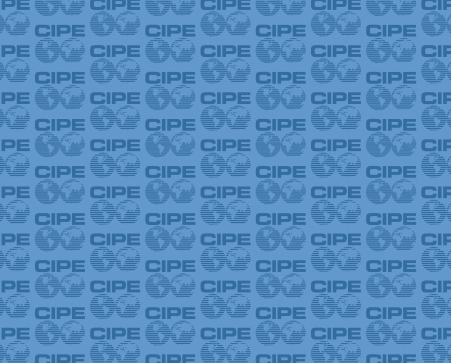 At the moment, CIPE is supporting local business associations to boost their capacity and work cross-regionally, which will create a reform agenda for the new government to improve the business climate in Ukraine. This is a chance for the business community to interact and make concrete reforms with the government in a constructive way. Individual rights, freedoms, and dignity that the protesters are seeking cannot be realized without the participation of entrepreneurs. The CIPE-Atlas Corps Think Tank LINKS Fellowship brings talented young professionals with strong research backgrounds to shadow researchers and experts at leading U.S. think tanks for six months. Iryna Fedets is a CIPE-Atlas Corps Think Tank LINKS Fellow at the Heritage Foundation. The opinions of Ms. Fedets do not necessarily represent those of CIPE.